Food trucks aren’t new. Cities like Portland and Austin have had the roaming food luxury for some time now and NYC has basically had food trucks for like ever. I was fortunate enough to see the trend take off in Chicago before we moved. In fact, my during my first run in with the cupcake truck, I also spotted the Chicago Blackhawks parading the Stanley Cup through a neighborhood bar. As a Penguins fan, I was more interested in the cupcakes. In the last few years, Pittsburgh has hopped on the trend too. In the fall, Brady and I went to a food truck rally in our hood and tried foods from two trucks (mentioned below). If you are looking for some quick eats in the ‘burgh, here are some options! · Dozen: Cupcake truck. Enough said. · Franktuary: Hot Dogs. This is one of the trucks that the hubs and I sampled. Delish! · BRGR: The delish burgers from BRGB and amazing kettle chips. Just if they could sell the spiked shakes. · Pittsburgh Taco Truck: This one is on my list. · Polish Pierogi Truck: Yoi! Yum! Not only do they serve Perogis, but they also have Haluski! 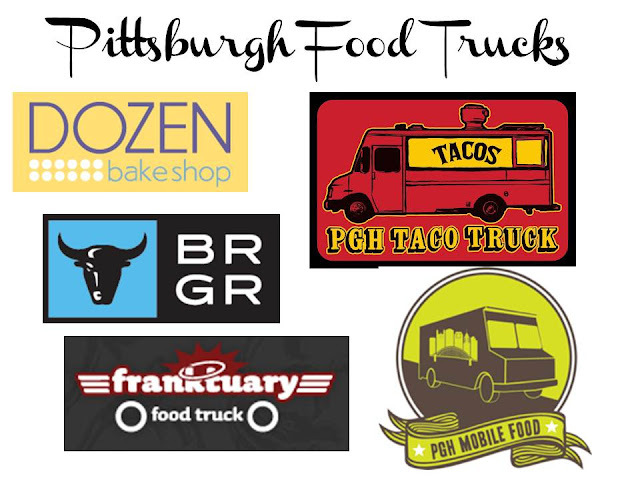 Wanna see more food trucks in Pittsburgh? Visit PghMobileFood.com to sign the petition! I'm from Pittsburgh and I definitely want to try these out over the summer! This trends sounds so cool.